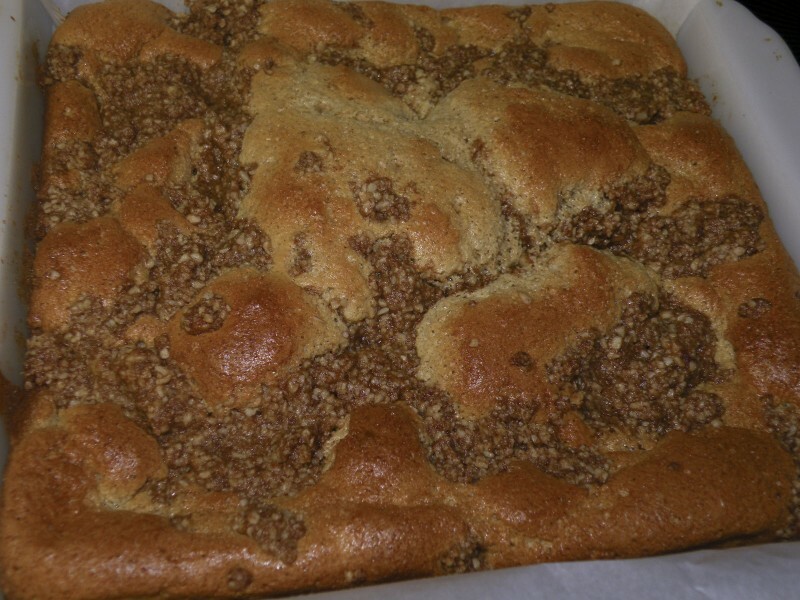 Remember making coffee crumb cakes in home economics class in school? Remember how that delicious delight all but evaporated as a delectable, occasional comfort food as waistbands expanded? Ba ba ba baaaahhhh! It’s a bird! No… wait… it’s a plane… It’s…. it’s…. Diana’s coffee crumb cake, and it’s sugar free, gluten free and perfect for diabetics (and those who are working to keep blood sugar stable). And guess what. You’ll never know what you were missing. Filled with flavor, texture and winning, this dessert just might be your new favorite sweet tooth avenger, whether it’s grab-and-go breakfast, with coffee, or after dinner. And guess what what. I want to also say, Diana is just pretty much freaking amazing. Between her gorgeous chocolate-covered roll cake and her Mexican bake, I want her to come and live with me. She keeps inspiring me in ways I didn’t even consider for oopsie roll batter. To make them look like something I slap myself in the face for wishing I’d thought of is just another of the many fabulous traits of her wholesome, delicious ideas. This cake freezes well, so don’t be afraid to sock some away for a rainy day. Don’t have cream of tartar? You can sub in an 1/2 tsp of white vinegar or lemon juice in place of the tarter to help stiffen those yolks. Freeze slices to send to school in lunches. This dish is gluten free, sugar free, vegetarian friendly, and only 4 net carbs per slice. This dish is not induction friendly due to addition of almond flour. Want to save a few calories? Use lower fat cream cheese. Diana uses the Ideal/Kroger co-brand of brown sugar substitute, but use whatever you have on hand. Separate the egg yolks from the whites. Whip the whites with the cream of tartar until stiff peaks form. Beat the egg yolks with cream cheese, substitute sweetener, protein powder, vanilla extract, and cinnamon. Fold this mixture with the eggs whites gently as not to deflate the whites. Spoon mixture in an 8 inch square baking dish lined with parchment paper. You can also use an 8 inch spring form pan, generously greased with butter. Set aside. Place almond flour, brown sugar substitute, cinnamon and butter in a bowl and combine with your fingers (or a fork or pastry cutter) until well combined. It won’t be crumbly, but it will hold together. Add half of the crumb topping to the Oopsie batter evenly (it may sink to the bottom). About half way through baking the cake, remove cake and add the remaining topping. Continue baking. While the cake should bake for 40-50 minutes, Diana says to be sure to start testing the batter after 30 minutes with a toothpick to test for doneness (a clean toothpick), as some ovens cook hotter than others. Combine heavy cream, sweetener and cinnamon in a heat-proof measuring cup. Heat in microwave or small sauce pan until sweetener has dissolved. Mix well, adding butter and mix again. You can whip this to make it thicker when it’s well chilled. Drizzle glaze on semi cooled crumb cake. Keep refrigerated. This cake is best served the next day, even though it may be hard to resist. It gives the ingredients time to come together. I’ll bet you could probably use coconut flour if you have that on hand. Nuts….no, I don’t have coconut flour (soy flour, almond flour, flaxseed meal…yes). Woud either of these work? Thank you for sharing what you have! I would likely go soy flour for this one based on how it behaves in baking (similarly to protein powder). Flax seed meal would be my second choice. Thanks so very much for the quick reply. You’ve definitely made my day because I’ll be making this tonight! I’ve been in a baking mood lately and looking for low carb treats. I am in that mood right no, but with crock pot dishes. I totally get it. Would you mind letting me know how your substitute of choice works out? Definitely will. If only I could make a living baking. Baking up wonderful treats, electric fireplace on, cup of coffee in hand and listening to Country music on radio…a slice of Heaven here on Earth! mmmm… these look really good! I am cutting out sugar, so I would substitute something for that (I’ll know when I get in the kitchen and play), but I love this idea. I’ve been sharing all of these on my Facebook Group… Cooking Clean with Kathleen. I have turned my life around by eating clean and healthy! Yay! Older age, hormone issues, stress issues and well, that whole gig made me “puffy” over the years, sooooo… back to eating very well, which includes splurges… good ones. Yes, how would you make this without sugar or chemical sugar substitutes…I am willing to use natural sweeteners like stevia or honey….any suggestions?? Hi, Kim! You can use any sweetener so long as the amount equates to the amount of sugar subbed in the recipe (we purposely leave it vague so users can choose your favorite sweeteners). Here is a table for subbing honey:http://www.pickyourown.org/SubstitutingHoneyForSugar.htm and one is for stevia: http://www.cookingwithstevia.com/stevia_conversion_chart.html Granted stevia will mean less bulk in the recipe, but in that recipe it might not matter. I’d definitely check them out. It’s so much nicer to be able to find it locally. I have ordered Ideal online before, but I am an instant gratification girl when it comes to needing/wanting ingredients. They definitely do. I like netrition, too! I usually find what I need very reasonably between netrition and amazon. Ok quick question on the sugar substitution. Can I use Agave Amber in place of the brown sugar? Or does it need to be a dry ingredient? I know it says equivalent substitute but wasn’t 100% sure it mattered between the dry and liquid in that part of the recipe. Really want to try this 🙂 Sounds super yummy! Attempting this first thing 2morrow. Looks divine. Looks sinful, I LOVE IT!! Made this last night and had it for breakfast this morning. Tastes amazing! I swapped part coconut flour and part flaxseed meal for the protein powder and added a pinch of salt to the cake batter. I also used agave for the crumb topping instead of brown sugar substitute (a smaller amount, of course). Turned out great. Finally, I whipped up the glaze into a cinnamon whipped topping instead of pouring it over the cake. Highly recommended! I agree. I love how simple and delicious it is. No frills. Just home goodness. I am so glad you had similar results and are happy with the results–and especially that you took the time to say so. You are the best! Turn the pan over and form aluminum foil over the back, tucking it together tightly. Remove the foil keeping the shape. Turn pan right side up and insert formed foil, gently easing it into the corners and bottom. That way you get a better fit with less or no tearing. Also, it helps in removing the cake(or whatever) from the pan with little breakage. I was going through an old Food & Family(Kraft Foods) magazine the other night and saw that they use the same method! You rock, Lee! What a clever way to do it! Absolutely wonderful and delicious. You are both so awesome. I have maltinol brown sugar alcohol and used that instead of the blend. But sooooo good. just one small problem and it has nothing to do with the recipe. The wax paper became a part of the cake, being pritty much absorbed. I tried to peel it off but gave up and ate it too with no noticeable texture change. Any suggestions on this? Thanks muchly and all keep up the wonderful work. Hi there! Did you use waxed paper or parchment paper? Waxed will generally melt at even fairly low temperatures, so I advise parchment. O Boy, I am a real dufuss. Yeah, I goofed and used waxed paper, not parchament. Oh well, I will add one carb to each serving. I just made oopsies for the second time, the first time I didn’t whip the whites long enough because it was the first time whipping egg whites so I had no idea what they should look like. Anyway they turned out great. Love the idea of sandwiches instead of LC wraps. 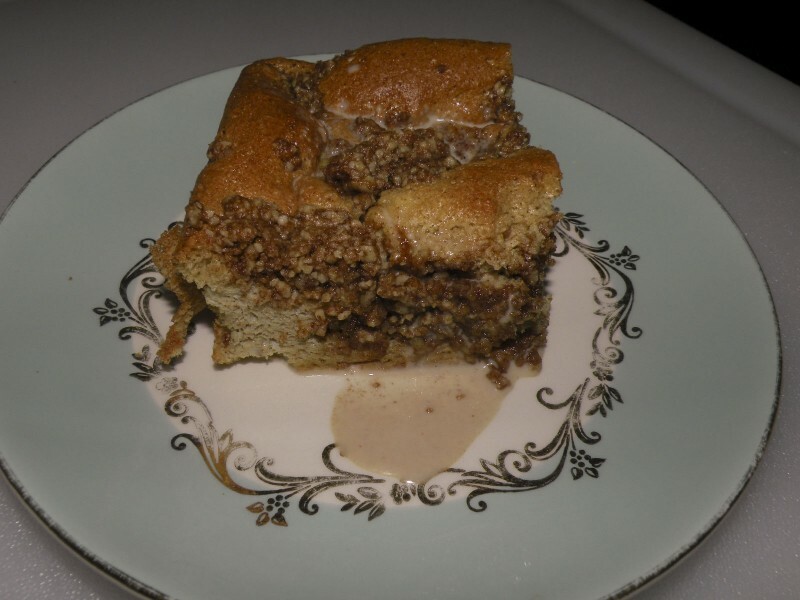 I will for sure be making this coffee cake , I’ve been craving it for so long. Question: has anyone tried to do this cake with berries? Or like an entammins cheese cake/Danish? Ooh, Cathy, I love your line of thinking! I am sure that would be positively delectable, and I happen to have a lot of fresh, fruity ingredients! Muahahahahaha! Please let me know how it turns out, lol, I’m just a copycatter. You are not! Besides, I’m crediting you for the idea if/when I make it. Heavenly! Thought I would share… jumped at the ‘Entenman’s’ concept… WOW! Added some crushed walnuts to crumb mix & used a mixture of 4 oz cream cheese, 2 packets Stevia, 1 Tbs almond flour (can sub milled flex) & 1 tsp vanilla extract. Beat & place it over cake last 10 minutes. Also followed suggestion to make glaze a whip. Can’t thank you enough for all the great recipes. You’re the bomb! Thanks so much for this recipe and for your website! Two questions. 1) Do you think a bundt cake pan would work? 2) How long would this last? Meaning does it need to stay refrigerated, or if not, should it not be sealed like some of the oopsie rolls (because of too much moisture?) Don’t want it to be dried out, yet don’t want it to be soggy either. We are soon going on vacation soon and the group always brings desserts. My mom makes a Jewish Coffee Cake and I think this could be a good substitute for that. THANKS for your website and recipes! Hi, Netsie! I would think you could try a bundt pan, but oil the heck out of it to prevent sticking. I’d think the cake would easily last a week if refrigerated. Your vacation sounds great! Kristen– the oopsies can do that! Mine tend to fall again after they have baked, so whe it holds its shape, that’s definitely something. But that it still turned out wonderfully is a testament to your baking skills and to Diana’s amazing tweak! This was absolutely delicious! Mine was high as well, maybe I whipped the egg whites too much, I’m not used to whipping egg whites so never know when to stop :D. The topping didn’t even think about going to the bottom :), it just sat right up on top. For the second applying of topping I softly pushed the first topping down a little so it went inside a bit. Also I whipped the glaze too much and ended up with whipped cream, so I just spread it on instead of drizzling :). Regardless, it was a forgiving recipe and was so so good!